It seems that all the announcements from CES were gadgets with iPod docks stuck on them. 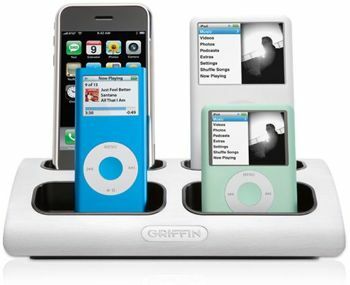 The PowerDock for iPod from Griffin dispenses with the gadgets and just sticks extra iPod docks on your iPod dock. Yes – everybody will know that you’ve got 4 iPods, but at least they’ll be charged when you need them. Griffin will offer the PowerDock in two sizes. The four-port model seen will go for $70 and be available in April, while a two-port version will sell for $50 when it debuts in June.